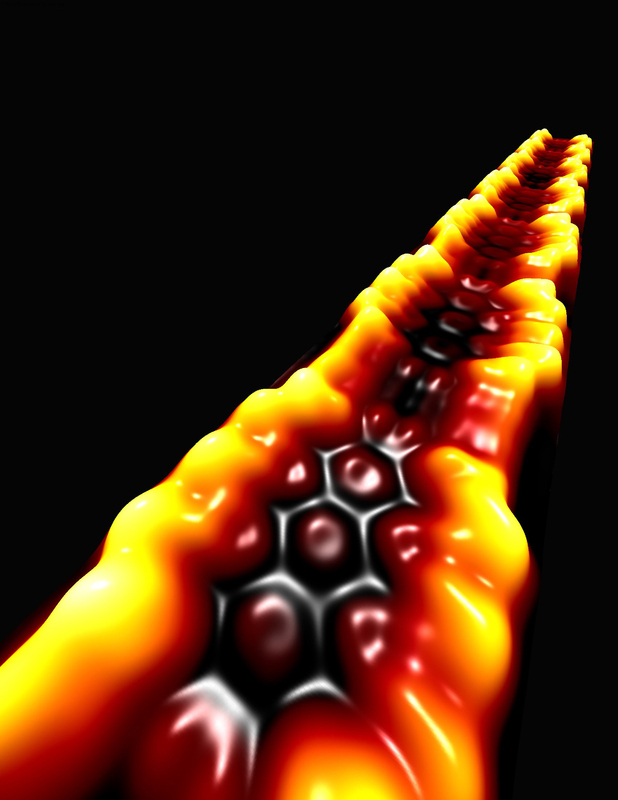 Scanning tunneling microscope image of a topological nanoribbon superlattice. Electrons are trapped at the interfaces between wide ribbon segments and narrow ribbon segments. The wide segments are nine carbon atoms across (1.65 nanometers) while the narrow segments are only seven carbon atoms across (1.40 nanometers). Scientists are experimenting with narrow strips of graphene, called nanoribbons, in the hopes of making cool new electronic devices. Now, researchers at the University of California, Berkeley (UC-Berkeley), have discovered another possible role for them: as nanoscale electron traps with potential applications in quantum computers. Graphene -- a sheet of carbon atoms arranged in a rigid, honeycomb lattice resembling chicken wire -- has interesting electronic properties of its own. But when scientists cut off a strip less than about 5 nanometers in width -- less than one ten-thousandth the width of a human hair -- the graphene nanoribbon takes on new quantum properties, making it a potential alternative to silicon semiconductors. Theoretician Steven Louie, a professor of physics at the UC-Berkeley, predicted last year that joining two different types of nanoribbons could yield a unique material, one that immobilizes single electrons at the junction between ribbon segments. This would require the electron "topology" -- the shape that propagating electron states adopt as they move quantum mechanically through a nanoribbon, a subtle property that had been ignored in graphene nanoribbons until Louie�s prediction -- of the two nanoribbon pieces to be different. Two of Louie's colleagues, chemist Felix Fischer and physicist Michael Crommie, teamed up to test his prediction. Together, they were able to experimentally demonstrate that junctions of nanoribbons having the proper topology are occupied by individual localized electrons. "This gives us a new way to control the electronic and magnetic properties of graphene nanoribbons," said Crommie. "We spent years changing the properties of nanoribbons using more conventional methods, but playing with their topology gives us a powerful new way to modify the fundamental properties of nanoribbons that we never suspected existed until now." This research was supported in part by the National Science Foundation (grants ECCS 09-39514 and DMR 15-08412). Computational resources were also provided in part by NSF through XSEDE resources at NICS.